« Do we have to deal with this? Ask Charlene Teters, a Spokane Indian, if this mascot concern is a trendy thing. 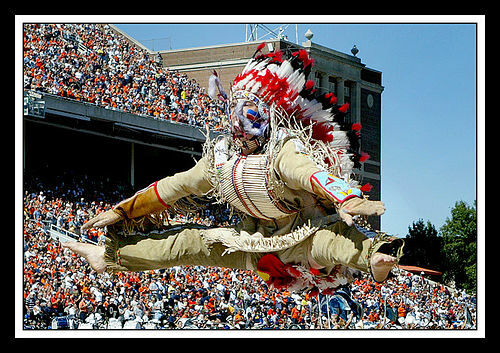 As a graduate student in 1989 at the University of Illinois, she watched her children experience humiliation as the university mascot, (fictious) Chief Illiniwek, pranced across the football field hooting and hollering in warpaint. Charlene has been a leader in the struggle to ban such imagery from sports ever since then. Take a look at the National Coalition on Racism in Sports and the Media. Doesn’t sound like a few-year trendy thing to me. In Whose Honor? is a powerful film that documents the tradition of using Indian logos and mascots in sports and the impact of that on Native American communities highlighting Charlene’s story and how she became an activist and launched a national debate on this issue. It’s estimated that in the 1970s, close to 3,000 schools and colleges had Indian mascots. It amazes me that some white people still have the arrogance to think they should be the ones to decide whether such mascots have negative impact. To name getting rid of these mascots as a passing fad is additionally insulting. Bob, don’t make that behavior a trend.